EDRM released a comprehensive set of guidelines that aim to objectively define and explain technology-assisted review for members of the judiciary and the legal profession. In this webinar, we will discuss the drafting and editing process as well as how the Guidelines are being used to develop a TAR protocol or exemplar on when and under what circumstances TAR should be used. Hon. James Francis, Southern District of New York, Ret. Participate in this live online discussion with our esteemed panel of experts as they discuss the importance of information governance in the current business landscape. Talking points will include an overview of the current state, the use of governance plans and procedures, driving forces behind the need for protocols, and the impact of data privacy and cybersecurity on data governance practices. Attendees will have the opportunity to submit questions before and during this interactive program. Submit your information governance questions to the panel before the webinar webinar@knovos.com. More than 250 federal judges responded to a survey from Exterro and Duke Law on how they view and handle discovery disputes and what they expect from lawyers. There is a lot of talk about strategies to prevent your data but what about your response plan if a breach does happen? Minimizing risk is essential, but just as critical for your litigation readiness plan is how to adjust your processes and measures in response. During this webinar, our panel of security experts will walk you through the steps and considerations following exposure. Chris Wolski, Chief Information Security Officer, Herman Miller Inc. Frequent news of high-profile data breaches at companies like Equifax, Target, Yahoo and more are proof that it’s no longer a matter of if, but when, the next company will make headlines for having personal customer data exposed, their brand and reputation left in ruins. Will your company or client be the next victim? During this webinar, panelists will discuss where to begin after the breach―from the initial identification and investigation, through reporting findings and learning from the incident. We’ll discuss the important role of legal throughout the process, and how legal and IT/Security teams must effectively collaborate to ensure a successful investigation. No two e-discovery processes are alike. But that doesn’t mean there aren’t universal principles and tools to evaluate and take steps to improve your e-discovery processes. Learn the seven steps to effective regulatory response and be prepared to respond quickly to ensure compliance. Regulatory agencies such as the SEC and CFTC can initiate an investigation into business activity at any time, bringing challenges beyond those of typical ediscovery. Regulatory investigations often relate to unclear charges, make broad and sweeping data requests under unrealistically tight timelines, and bear severe consequences for noncompliance. Organizations need to be prepared to identify, preserve, and analyze relevant information rapidly and accurately. In this webinar, Zapproved will discuss seven clear, actionable steps to launch a successful regulatory response. These steps start with strategizing and preserving data before moving into assessing information, negotiating the terms of the request, creating privilege logs, and keeping the lines of communication open. Any organization subject to regulatory oversight could be investigated at any time. Prepare today so you can face tomorrow with confidence. Complex Litigation management is no easy task and managing the growing amounts of data from different teams can seem impossible. Does your case management tool help you manage multiple cases in one dashboard? Are you able to visualize all of your data at once and create clear and persuasive charts and graphs to tell your story? Are you able to keep your law firms from duplicating efforts? Register for this webinar to learn how you can leverage the latest technology to link case profiles, contacts, calendar items, transcripts, exhibits, pleadings and other litigation materials together for one-click access. The panel of experts will share strategies for simplifying complex litigation management and multi-case data in one central repository to reduce time, effort and cost for all legal teams involved. Bring Your Own Device (BYOD) policies present many benefits for both employees and companies, but they also bring unwanted risk associated with allowing individuals to access and share company information through non-monitored personal devices. AccessData and Corporate Counsel Business Journal have partnered on a survey of Corporate Legal professionals to identify current BYOD trends and concerns, and understand the impact it is having on e-discovery. Join us for this one-hour webinar where we will review the findings of this exclusive survey and highlight best practices for organizations allowing personal device use for business purposes, to help ensure data is protected and accessible in the event of e-discovery. In this Zapproved webinar, legal professionals walk through how to bring ediscovery in house to better control process, improve outcomes, and lower cost and risk. Tune in for their six best practices, from envisioning the end goal to hiring and training your team. If you haven't noticed, e-discovery is bigger than ever. Just look at the news for the past couple months and you'll see the Facebook/Cambridge Analytica scandal, the Mueller investigation, GDPR, and more. But the e-discovery community is still missing a comprehensive report reviewing what has changed in the last year. . . . Until now. Many have heard of the Panama and Paradise Papers where millions of sensitive documents were released to the public. Cybersecurity is not a new issue and the damage caused by attacks is rising exponentially each year. In fact, it is expected that cybercrime damages will reach 6 trillion dollars by 2021. Of the organizations targeted, law firms are seeing a rise in attacks due to the nature of the data they hold. In this presentation, a panel consisting of legal and technology experts, moderated by Tim Opsitnick of TCDI, will discuss the current trends in cyber attacks, why attackers are focusing on law firms and the techniques they implement, and the legal and ethical obligations a lawyer has in regard to protecting his or her clients' confidential data. Speakers include David Shonka, Former Acting General Counsel, Federal Trade Commission; Eric Vanderburg, Vice President, TCDI; and Kevin F. Brady, Of Counsel, Redgrave LLP. Legal departments are tasked with managing more data, from more sources than ever before during e-discovery. The exponential growth of data sets, coupled with the need to reduce cost while still ensuring data security and privacy, can feel overwhelming. We’ve seen a rapid migration to the cloud by corporations as a way of managing data, reducing overhead expense, improving efficiency and collaboration and other advantages. But the movement to the cloud can also present some challenges, especially when e-discovery requires collection of data out of cloud platforms. Get a sneak peek at new legal research conducted by EDRM/Duke Law, Exterro and BDO Consulting on how judges are enforcing new e-discovery rules in their courtrooms along with judicial insight for improving e-discovery outcomes. In this webinar, two federal judges will walk attendees through the judges survey results and offer their own perspectives for implementing defensible but yet proportional e-discovery practices. Hosted by George Socha, cofounder, EDRM. Sponsored by Exterro. Learn about technology-assisted review methodologies, workflows, and uses in this comprehensive overview of TAR. We'll review what predictive coding methods are available, how they work, and what methods are recommended for specific situations. And we'll hear from a federal judge on why you need to understand TAR. Hosted by Jim Waldron, director, EDRM. Sponsored by Knovos. The year is almost over, but before we start looking ahead to 2018 it's important to look back and clearly understand how your e-discovery and legal processes stack up against those of your peers. In this upcoming webcast, learn how in-house legal departments are trying to become more productive and reduce legal spend. We'll review new legal research conducted by EDRM/Duke, Exterro and BDO Consulting to examine trends, what's working, and what's not. Sponsored by Dechert LLP; hosted by Jim Waldron, director of EDRM. Join us for a discussion of the E.U. General Data Protection Regulation and the new People’s Republic of China data privacy law and the potential impact on e-discovery in litigation. We'll also discuss how changing technologies in cloud computing might impact preservation and collection in e-discovery, including cross-border data sharing. Presenters include experienced attorneys from Dechert LLP based in the U.S., Asia and the E.U. The session will conclude with a Q&A. 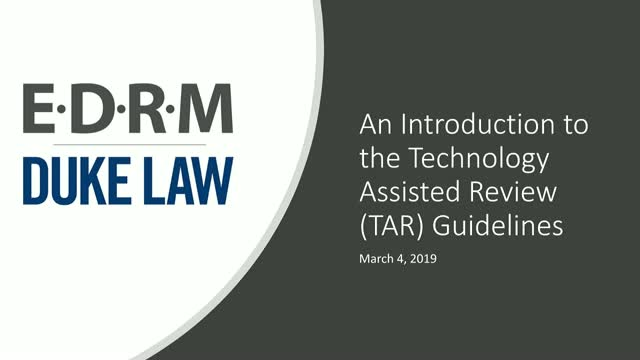 Technology Assisted Review (TAR) has been judicially approved for use in appropriate cases for several years now and is a powerful tool to maximize efficiency, accuracy, and savings in document review, legal investigations, and beyond. Yet most corporate legal departments and law firms are not utilizing this tool. What is holding them back? In this webinar sponsored by NightOwl Discovery, learn from industry experts about low-risk use cases for your first predictive coding project and practical tips from the trenches on what has (and has not) worked to educate and prepare the legal team to use TAR (or predictive coding), to set up the project and deadlines, and to effectively train the system to most efficiently categorize and rank documents. Join George Socha, co-creator of the EDRM, as he moderates a conversation with Bonnie Kennedy of Delta Air Lines, Avi Benayoun of Greenberg Traurig and Adam Strayer of BDO. They will discuss the TAR workflow and the importance of open communication between and among the client, the law firm, and the service provider. These three litigation and ediscovery experts will talk about expectations, transparency, and some of the information black holes that can develop during the predictive coding process. Creating practical resources to improve e-discovery and information governance.